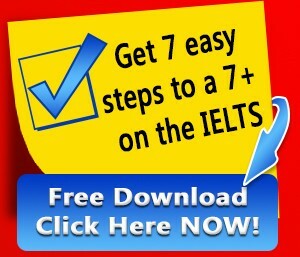 There is one cool trick that you can use to get yourself a higher score on the IELTS Speaking test. If you use a strategic pause when you deliver your speaking answers it will give you a sense of momentum and it will allow you to re-center your mind. If you slow down your answers will be more organized. You will be more fluent and coherent. You will use better vocabulary. It’s never a bad idea to slow down on the Speaking test. This may also help us feel more centered in our body and less anxious. Remember, this doesn’t mean that we are pausing due to lack of words. This is a strategic communication device. Find out exactly what you need to do every step of the way to get your target score. Stop guessing what you should be doing to prepare! Click here to get the checklist. A: Well…..I think it’s important to be on time but my friends don’t since they are always making me wait for them. On the other hand, I show up at least 10 minutes early every time we meet. Use the phrase “wait for it” + pause : You can use this when you are about to say something surprising. This would immediately put the examiner in the mind frame of a 7 for you for vocabulary as well as fluency and coherence. If you can add a sarcastic point like a surprise after saying “wait for it” then you will definitely impress the examiner because you’ll be using a very high level language tactic. A: Wait for it….I am a clown on the weekend. Yep, I go to birthday parties and I know how to juggle. Have you used the dramatic pause in your Speaking test?